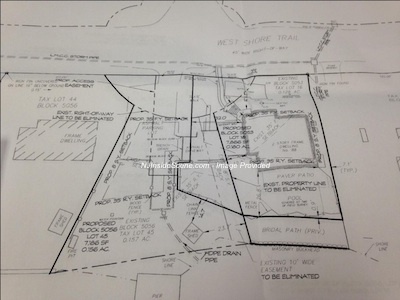 Residents who requested minutes from the Lake Mohawk Country Club property line transaction said that this document was not attached to the contract of sale. Image provided. 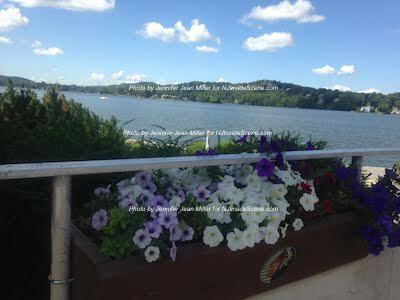 SPARTA, NJ – Lake Mohawk residents filled the meeting to beyond standing room only capacity for a second week straight at the Lake Mohawk Country Club Trustees Meeting on August 24. The bustling meeting focused on the property line transaction with a portion of land from Tamarack Beach plus West Shore Trail annexed to residents Greg and Celia Leo of 88 West Shore Trail. Click here for the initial article. After two packed and somewhat heated meetings, the trustees announced they had agreed to enlist the assistance of outside counsel to assess the contract from 2012 and its validity. At that time, Block 5056, Lot 45 began the transfer process with a $1,500 escrow deposit to kick off the transaction upon its signing. There have been no payments since and because that $1,500 has been in escrow, the club has never technically received any compensation yet for the transaction. The payment schedule on the contract called for a 19-year term after the initial deposit of $1,500 annually at zero percent interest. 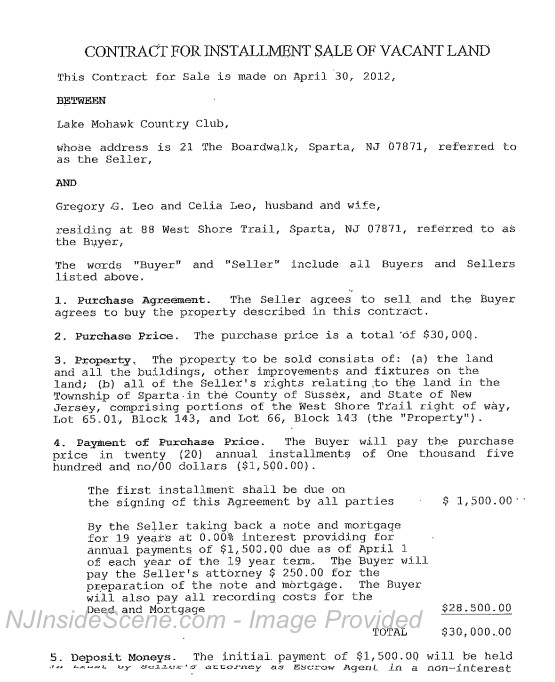 A copy of the contract in question between the Leos and the Lake Mohawk Country Club. Image provided. The Leos moved forward with an appearance in front of the Sparta Planning Board this past Aug. 5, with most residents unaware of the pending transaction until the meeting’s advertisement on July 24. Trustees announced they would also plan to speak to the township planning board about seeking a continuation of the matter, deferring it until the questions about the contract have been fully resolved. The transaction involved about 1,387 square feet, with 961 from West Shore Trail and 1,415 square feet from Tamarack Beach to be sold to the Leos. 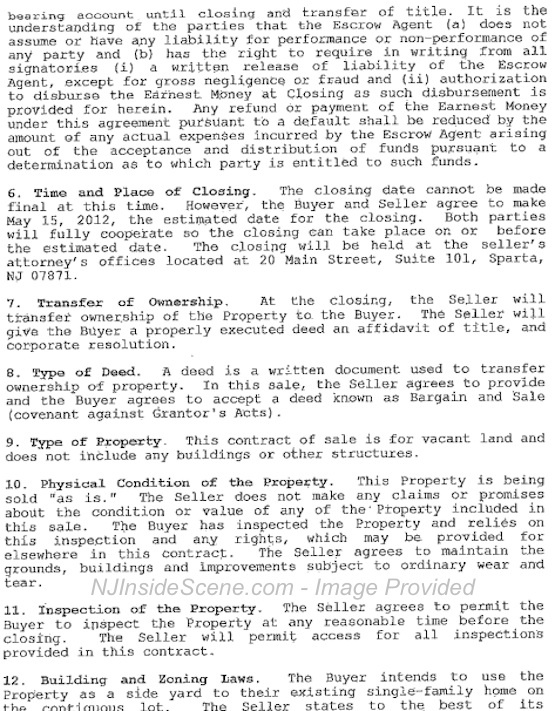 More details have since emerged about the nature of the transaction and the reasons why property was sold to them. Property was expanded to provide a greater easement for the property’s septic and also to expand the lot for the pool area on the Leo’s property. For those who have researched the documentation from the 2012 transaction, plans have not been located to accompany the contract, nor does the contract provide exact specifications for the transfer outside of the lot numbers. Many residents have expressed their concerns about the contract’s legitimacy, inquiring too if the statute of limitation has expired and if the contract is no longer enforceable since it has not been fully completed since its signing nearly three years ago. But, the Leos did move the fence onto the beach property for what would be their new property line, shortly after the contract’s signing in 2012. According to club representatives, they were entitled to because the contract was finalized and executed, though it has not been completed. The easement for the septic, which was provided for about 15 years ago, was also allegedly not properly registered with the Lake Mohawk Country Club’s then-attorney, George Sweeny. Sweeny is also said to have been the party who drew up the contract between the club and the Leos in 2012. Though it had been unclear if the bridle path had been a part of the transfer and many residents feared that, board president Gregory Yuskaitis explained that the bridle path has remained intact but that there were shrubs in the way of it. He said that once they are removed the path itself would be visibly clear. Some residents have also expressed their concern that there was an inside deal with the land. Board members, especially those who had been on the board in 2012, stated that this board has made even greater strides in maintaining transparency. They vouched that it was not an inside deal and it was something appropriately discussed in executive session and later voted on after the executive session in the public session. However, board members noted that rarely do residents stay beyond the executive session to hear the outcome and votes once the board returned to public session. However, no records of the minutes from that time period show a vote on the contract. Another concern with many residents is who is fronting the fees for the engineering and legal teams. Though the document indicates the Leos are responsible for the permits and approvals, the application for the planning board has been jointly filed between the Leos and the Lake Mohawk Country Club. Residents who spoke about this topic have iterated that the Leos should be responsible for the fees, not clubmembers. In the meantime, the Leo property has been listed for sale with the lot size including the land from Tamarack Beach. 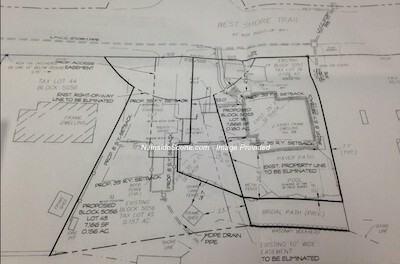 The lot size is 77X105, with the property currently listed at $975,000. It was first listed on May 20, 2015 at $1,190,000. Residents lined up to take their turns at the microphone. Some of the debacles at the meeting entailed the dispute over the property line itself. Celia Leo has maintained that her fencing has followed the lines of the previous owners. Barbara Wortmann had been the previous owner of the home just before the Leos and took to the microphone as well, just after resident Robin Wood spoke on the matter. Wood clarified the property line situation as a resident who has lived in the area for 54 years. She told attorney Debra Nicholson, representing a party that had been interested in purchasing the Leo property that the property was used in the 1960s and 1970s very steadily. Nicholson had asserted that the property had not been in use. Additionally, the paperwork drawn up and for the Leo family and club officials referred to the property as “vacant” though it was beach land that was in use. Nicholson also later learned during the due diligence process that the land for annexation to the Leo property had not been fully transferred to them. Wood recounted that she used to play hide and seek in the beach bushes as a child in the area in question. She said there was also a hammock that everyone enjoyed, which is now on the property line that the Leos have crossed over. Additionally, until 2001, people were able to use that section for sunbathing and it was then fenced off. Counsel for the club, Megan Ward of Kelly & Ward LLC offered some ground rules on conduct, receiving applauds for her statement, chastising those who were shouting from the floor, noting it was “unacceptable,” and everyone was entitled a turn if they were on line. Wortmann said that there was a split rail fence between her then-property and the beach, however the property line was still very fluid for both residents and Wortmann, who had people parking on her side of the fence, though it was something she said she did not mind. She volunteered her time as a beach president. She also said that the beach was definitely in use. “We had an extremely active beach,” Wortmann said. In addition to the hammock, the beach also had a shed she said. When Celia Leo had her turn she apologized for her interruption, but said that she has been frustrated and the facts about the transaction have been twisted. She said that though her husband was away at the prior meeting, she was at the meeting last week and was upset by things that have been said and both have been hurt. Leo said that the club actually brought the idea of the transaction to she and her husband and fingered Ernie Hofer as one of the parties who brought the transaction to them as she returned to her seat. While several members of the board spoke, attendees encouraged Hofer to take the podium. Board members who did speak asserted transparency with the current board and felt it important to shed light on the transaction. They also noted that when the transaction took place in 2012, the club was experiencing financial difficulties and seeking ways to make money. Ward did not recommend that Hofer speak, although members of the board had spoken. Attendees questioned Ward, asking why it would be acceptable for members of the board to speak who were there, but not Hofer. Yuskaitis sided with Ward’s advice in her role as legal counsel and it was what she advocated. Yuskaitis suggested potential litigation as the reason. But Hofer decided to speak briefly and did shed some light on the details of the transaction. He said that the board in those days “tried to be transparent and put the community first,” plus executed about five other similar deals related to septic and driveway issues over the last 10 years. He said following the financial crisis of 2009, with monies from previous years having added about $300,000 annually from catering, it dipped to about $30,000 and then to zero that could be counted on from the catering budget. This was one of the ways that club officials surmised money could be added to the coffers to help offset the fiscal struggles. A property line transaction has many residents of Lake Mohawk asking questions. Photo by Jennifer Jean Miller. Hofer said the property appraised for less than half of the $30,000 purchase price given to the Leos. However, they were allocated an interest rate less than that of the club at the time (two percent) and a higher purchase price, with zero percent interest. Several members stated that the community at large would be amenable to talking out these types of land transactions if it was brought to their attention, rather than potentially losing sections of their recreational areas to real estate transfers before it was discussed. They said that decisions like this about recreational land should not be made without clubmember input. One of the former Tamarack Beach officers stated that beach members had expressed interest in expanding the recreational areas of the beach to accommodate a horseshoes game area or a place for bocce ball. Ironically, beach members had invested about $100,000 into replacement of the bulkhead at the beach and were given a loan from the club for $53,000 — at five percent interest.